During my lunch break today I went to the ice skating ring with a friend from work. I hadn't been ice skating for ages and I really felt like ice skating today for some reason. We got to the ring at around 1:10pm, the guy at the door told us we could ice skate till 2PM. We told him that would be more then enough and we each paid KD1.5 which is the entrance fee and you get free skates. If you want pro-like skates they cost an extra 750fils. 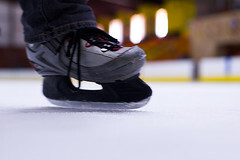 Once I stepped on the ice I realized that although I had taken ice skating lessons as a kid, and although I used to ice skate while in high school, suddenly it was as if I had never ice skated in my life. I totally forgot how to ice skate, i spent the first 15 minutes skating while holding the side walls. Luckily for me, there was no one at the skating ring except for me and my friend or else I am sure people would have laughed at me. After I gained some courage I started skating towards the middle, it was really great and fun. The idea of skating during my lunch break is ingenious. I was able to skate for 30 minutes, have lunch at McDonalds and get back to the office all within a hour. And, when I got back to the office I was totally fresh and ready to work. I think I will do this more often. Sorry to have missed it Mark. I think it would have been nice.